Anyone else thinking I might end up on some epic fail video compilation? Son is standing by with video camera just i case. From memory designed an antler from the Grinch and printed it out. 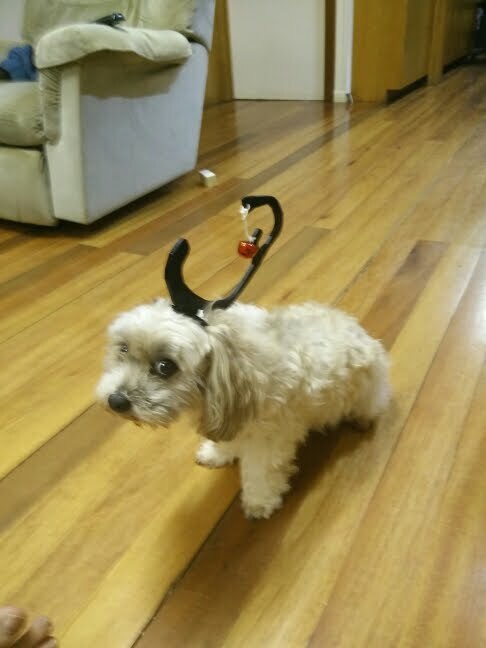 Made our own "max the reindeer"
Some of you may remember my Mario Bros. Star tree topper from last year. Well I didn't design that. THIS year, I designed a tree ornament. 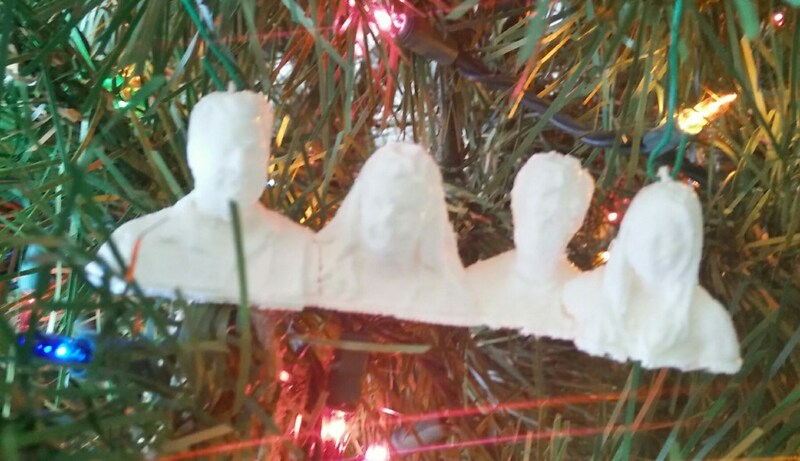 it is a 3d print of the 4 of us. Install FREE version of 'Skanect' on your mac or PC. then hang it on your tree. My family kicks off the Christmas season by hunting for the perfect Christmas tree. Only, we don't have tree farms here, we have instead, an artificial tree we brought from the U.S. Still, we have this little tradition where we go tree hunting anyway, even though it's not really a thing here. My wife and I wanted our first Christmas in PNG to be a good experience for the kids instead of a reason for them to miss home even more. I spoke to several of the dads around centre and tried to get them to agree to put all our trees in one big area and call it a farm, and we could all go there and find our own tree. Mimicking the experience we had in the States. We could hunt around for a bit, eye the other trees, have my wife say something like 'well it's sparse in the back but if we turn that side against the wall....' etc. Every guy thought it was cool to do, but none seemed willing to actually DO it. So, the day came when we had to pull the tree out of storage, and I decided to wing it. I was out in our outbuilding which was filled with lumber and scraps from the previous family. I happened upon this tiny little piece of plywood that had a red and green "Merry Christmas' painted on it. It made me chuckle and reminded of a Tree Farm sign. Rather than simply take the tree from the shelf and go back inside, I quickly painted "TREE FARM" on the opposite side of that little piece of plywood, nailed it to a flimsy little stick, and went outside in the front of our yard, planted the sign in the yard, and then took our little five foot tall, pre-lit, in a plastic pot, artificial Christmas tree, and stuck it in the bushes near our house. (The family was none the wiser). "Okay kids, load up the car! It's time to go to the Tree farm!" I shouted. It was met with confusion. They were 6 and 8 years old at the time, and tree hunting to them was up in the hills with family. So doing that in this country did not seem like a possibility. In subsequent years, Kendal has made cocoa and we've added Christmas music in the car via an iPod, and also a trivia game. But that year, we just all drove around with a saw, and the kids at first were like 'this is really weird' but then after a while they kept seeing tree after tree that we could cut down. I drove around in circles on centre for about 30 minutes and then I slowed down near our house as one of the kids saw a 'TREE FARM' sign. Kendal looked at me with a 'What did you do?' inquisitive smile. We walked around the yard, looking at trees. I told the kids 'there's a perfect one here somewhere.' I paused at times to let the kids bicker over whether or not to cut down our lemon tree, and slowly guided them towards the 'PERFECT' tree. They found it, and were excited, we pretended to cut the fake tree down, and just like that, a tradition was born. It was providence, if that little piece of plywood hadn't been there, the idea would never have hit me. 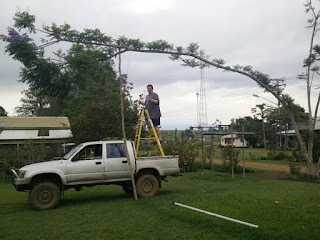 The tradition turned our first Christmas in PNG from "this is a tiny little fake tree, this is NOT like home at all!" to "Hey! We can do things here we've never done anywhere else! That was weird and fun, and we look forward to the little fake tree hunt every year!" Over the years we have tried variations, and some worked and some didn't. One that worked was, that the kids have to answer Christmas trivia and whoever gets it right, gets to choose which way we turn at the next fork in the road. THIS is very difficult for dear ol' dad who knows where the tree is, and knows if the kids choose the wrong direction, it'll be another 15 minutes in the car or so. This year is our daughter's last Christmas in PNG. (I mean, for the foreseeable future, who knows what God will do.) So this year, our Christmas trivia was all about our past family PNG Christmases and our traditions. It was a 'best of' kind of thing and the kids, now 8 years practiced at this (we've been in country for 10 Christmases minus 2 while on furlough), guided the truck to the 'Tree Farm' and found the tree within 40 minutes, while we sipped cocoa and played Bing Crosby on the car radio. We have decided as a family that we're not going to use the word 'LAST' or 'FINAL' because focusing on it being our last Christmas, just the four of us, will ruin all the good times by tinging them with sadness. It was wise advice. So we don't say it. But still, I popped awake at 4:30 this morning thinking 'This is the last one with Syd, so I gotta make it good!' And it was, it was fun, we enjoyed it, and then we moved on to the next thing we had to do for the day. I find it interesting, that this little tradition that started because two parents wanted to help their kids transition into the country well, has become something to help their parents transition as our little girl leaves the nest. It's a transition tool for me now, as because was thinking about our many memories as I hid the tree. Life is funny sometimes. Other music evokes a memory, and a linked emotion. Today I was listening to a John Williams' 'Superman Main Theme'. I grew up with Christopher Reeves as my Superman. Second to that was George Reeve with old Superman t.v. shows..
the new superman fights like superman should but he's too ...alien for me. super-heroish about any of them today? Powers? No, for me it was always character. Still is. Today's modern heroes are people with character, strong morale fibre. I just really like that piece of music.